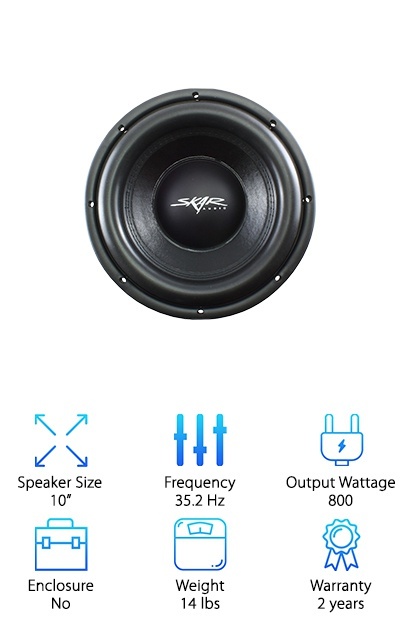 If you have a compact car or are looking for the best truck subwoofer, you’ve come to the right place. We’re here to help you find a product that really lets you bump your bass. With the best shallow mount subwoofer, you’ll be able to set up an awesome system. We did a lot of research to find the best products for you. Before we get started, let’s take a closer look at some of the features you need to know. 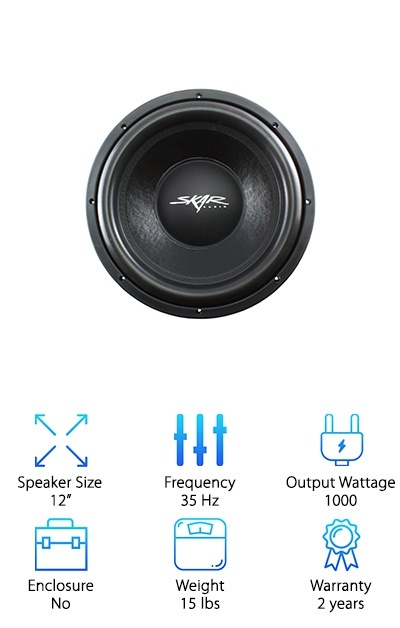 Speaker Size: All of the products that we chose for best shallow mount subwoofers are either 10 or 12 inches in diameter. The size that is best for you depends on how much space you have in your vehicle. Frequency: Frequency is measured in Hz. 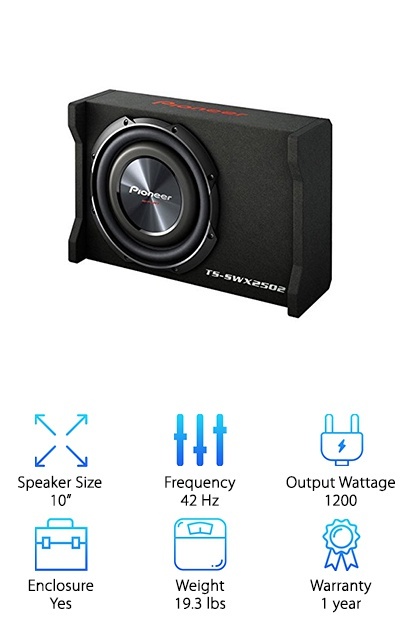 Since subwoofers are for pumping up the bass and bass has a low frequency, you actually want this number to be somewhat low. Low lower the Hz, the more bass you’ll feel. Output Wattage: The higher the wattage, the more power something has. And the more power it has, the louder it is. The number we used it the max for each product or what it hits at intense moments in the music. Enclosure: One of our top picks comes with an enclosure to keep it protected and a little easier to install. That said, if you have a small space to work with, building your own enclosure is something you might prefer anyway. Weight: When you’re installing something into your car, weight is always important. While none of these on their own weigh enough to really affect anything, remember that they are going to be used with the rest of the system. Warranty: It’s important to know what is and isn’t covered under warranty. Also, keep in mind that the longer a warranty is, the more confident you can be in your product. It shows that the company really stands behind it. 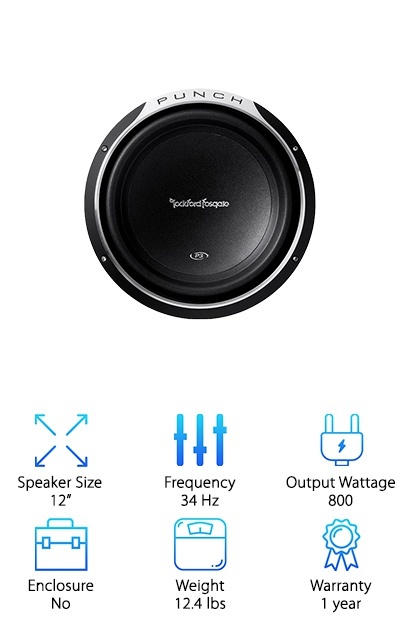 Now that you know the important features to consider when you’re shopping for the best low profile subwoofer, we can get into our reviews. Here’s the deal: the first 2 items in our list are our top pick and budget pick. If you’re in a hurry, make sure you check them out first. They’re both great items and will give a good idea of what’s available. Then you’ll find the rest of the items rounding out our best list. Ready? Let’s get going! Our pick for best shallow mount sub is the Pioneer TS-SWX2502. They’re designed with angled push terminals so it’s easier to connect speaker wires. And get this: they utilize an oversized cone that provides a greater surface area. What does that mean for you? A louder, deeper bass because more air is able to move through. The innovative enclosure gives you a lot of options for installation - put it in the cabin, luggage area, etc. It’s definitely one of the best subwoofers for trucks. And get this: the enclosure is fully carpeted. What does that mean for you? It’s non-slip and scratch resistant. 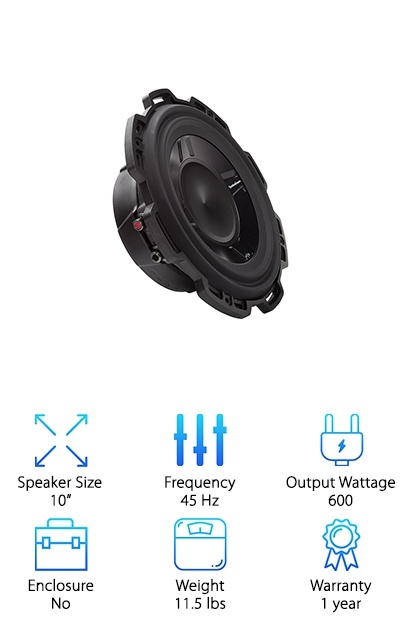 If you’ve been having a difficult time finding a subwoofer that fits in your truck, this is one you really need to take a closer look at. Our budget pick was engineered to sound great while still being able to keep a shallow footprint, all for a reasonable price. And get this: it performs as well as other shallow mount woofers that are much more expensive. This one uses a high temperature 2-inch voice coil that makes it a solid performer while still keeping it compact enough to mount in tight spaces, even under your seat. These subwoofers use only the best materials, including a competition grade cone and high strength foam surround. What does all that mean? Even though it’s small, it’s still going to give you a mighty sound. If both your mounting depth and your budget are a little bit limited, make sure you take a closer look at the Skar Audio VD-10. Rockford Fosgate developed these subwoofers to give the sound of a deep subwoofer for vehicles that don’t have the space to accommodate them. They call these their “Punch” model because, well, they do indeed pack quite a punch. The cone and dustcap are made of lightweight and durable anodized aluminum. They’re easy to drive but will also maintain their shape when you really crank up the volume. Flex Fit and integrated spider venting on the stamp-cast basket make installation easy. These subwoofers sound great whether you use them in a sealed or vented enclosure. That’s good to know because you might be building your own enclosure and this will make it a little easier to plan. One more thing. Because of the dual voice coils, you can actually wire multiple subs together. 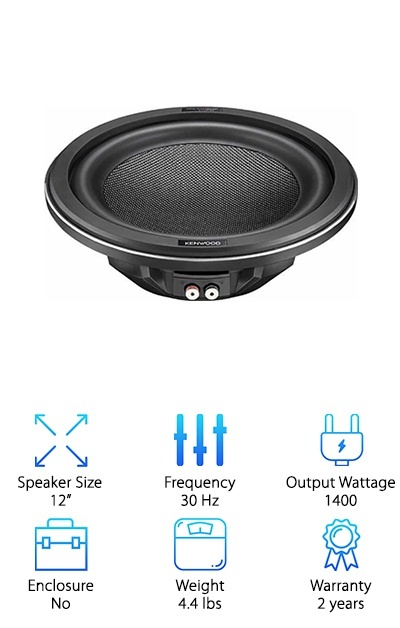 Another choice for best shallow mount 12” subwoofer, the Excelon from Kenwood has a lot of interesting details that make it so effective. One of the things that makes this best shallow sub special is the way the cone is designed. It’s made of carbon-glass fiber that is composed of a unique honeycomb pattern. What does this do? Allows the cone to react quickly in even the most demanding conditions while maintaining its shape. To help control any resonance and distortion, the cone sits in a firm yet flexible rubber surround. As far as the basket, it’s made of die-cast aluminum and helps distribute heat through numerous vents. And that’s not all. 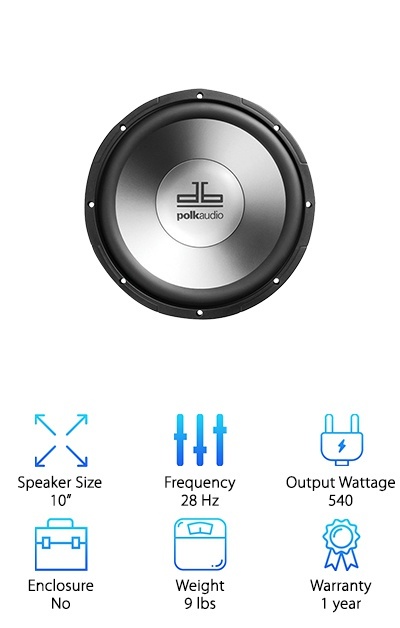 The connections on this subwoofer are silver-plated, easy to use, and provide excellent signal transfer. 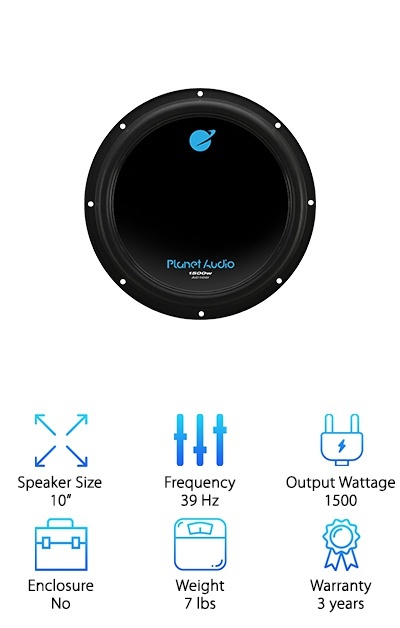 Planet Audio’s contribution to our best shallow mount subs list is their AC10D. Max wattage is 1500 but for continuous power handling, it’s 750. The polypropylene cone is designed to give you a great sound. It’s also durable enough that you can bet it will last a long time. To keep the cone in place, self-dampening foam surrounds the cone to buffer its movements. Another thing that’s great about the construction of this subwoofer is that the voice coil is made of aluminum. Why is that good? Because it’s low density and also resists corrosion. This one is designed to work in a sealed or ported enclosure but does need some clearance, so check out the specifics. This is another great choice if you’re looking to kick up the bass without breaking the bank. If you happen to be looking for the best shallow subwoofer for your boat, well, you’ve come to the right place. The db1040 from Polk audio is certified for marine use in part because they are sealed and ported. It’s actually a standard part of the sound system from some boat manufacturers. But that doesn’t mean they wouldn’t sound amazing in your car or truck, too. In fact, they’re a great choice for any vehicle. Why? They’re made tough and will stand up to some tough environments. Polk actually performs rigorous product testing on everything it takes to ensure durability and performance. One of the coolest things about this subwoofer it the polypropylene cone. It includes a rigid dustcap that gives the cone more stability and keep distortion to a minimum. 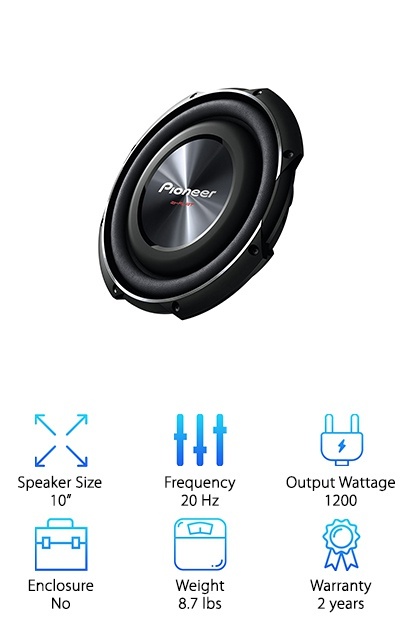 Pioneer has developed these shallow mount subs with multiple features to keep them compact while still providing amazing bass. They’re compact enough that you can even install them underneath some seats. The mounting depth is impressive at only 3 ? inches. That’s pretty shallow even when compared to other subwoofers designed with the same thing in mind. If you have a cramped space and have been looking for something really compact, give this one a go. The sound is phenomenal because of the cone. First of all, it’s made from a mold injected with resin. This makes it rigid and strong. It’s oversized with more surface area so more air moves through. And that? That translates to a louder and deeper bass for your sound system. This is one of the best truck subs around. If you’re looking for a 12” shallow subwoofer that’s engineered for amazing sound, we have found a great option for you. Skar Audio is a name we’ve seen before because it’s pretty clear they know what they’re doing when it comes to stereo equipment. This subwoofer uses a 2-inch voice coil that’s designed to take high temperatures without affecting its performance. They use high quality parts to make sure you always get the best sound. Because they still manage to maintain their shallow footprint, they’re really versatile in that they can be mounted in a range of vehicles. What do we mean? They’re shallow enough that they can be mounted under your car seat if that was the only room you had. It’s also made to handle a lot of power - up to 1000 watts! 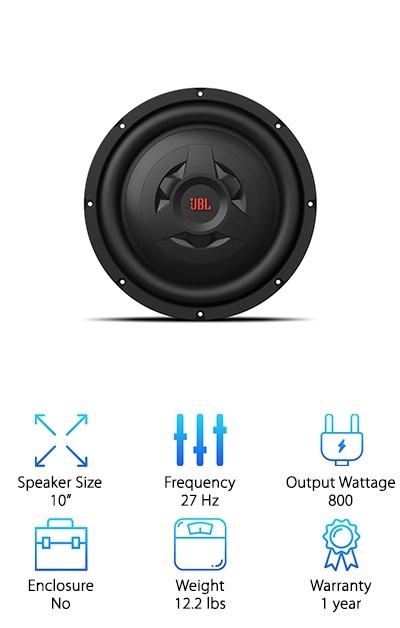 The thing that makes this shallow mount subwoofer from JBL so effective is that it knows how to use every last bit of power it has. That’s why you get such a big sound from something so compact. JBL puts all of their speakers through rigorous testing, including extreme hot and cold, heavy exposure to UV light, and even running them at full power for days on end. Their goal is to give you a product that lasts and they do everything they can think of to make sure that’s what happens. This subwoofer comes with a polypropylene cone that delivers exceptional sound. Plus, you can control the amplifier with the flip of a switch. It can get to lows that a lot of other shallow mounts can’t which makes the sound pretty incredible. Rockford Fosgate has managed to put together a great sounding shallow mount subwoofer that’s only 3 ? inches deep. If you’re looking for something that’s going to fit just about anywhere, give this one a closer look. Get this: the fiber cone is strengthened with Kevlar fibers. Yes, the same material that’s used in bulletproof vests. A sealed, half-roll of polyether ester supports the cone for extra control and support. The frame is made of low-profile aluminum that has plenty of venting to help control the temperature. This one is set up to be wired to multiple subs or you can fine tune your amp. However you decide to use it, you’ll get amazing sound in places you never thought it was possible. One more thing: it comes with a 60-day money-back guarantee.